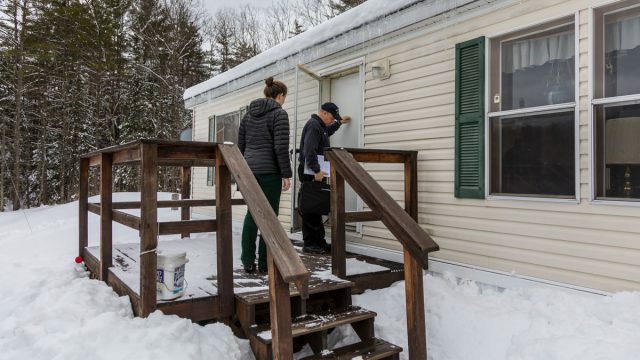 The pilot Community Paramedicine project, developed and implemented by Valentini and LeClair, partners medical students with Upper Valley Ambulance paramedics and EMTs to make house calls—the first partnership of its kind in New Hampshire. Rooted in compassion-centered medical care, the project took shape while both Valentini and LeClair were Rodis fellows. 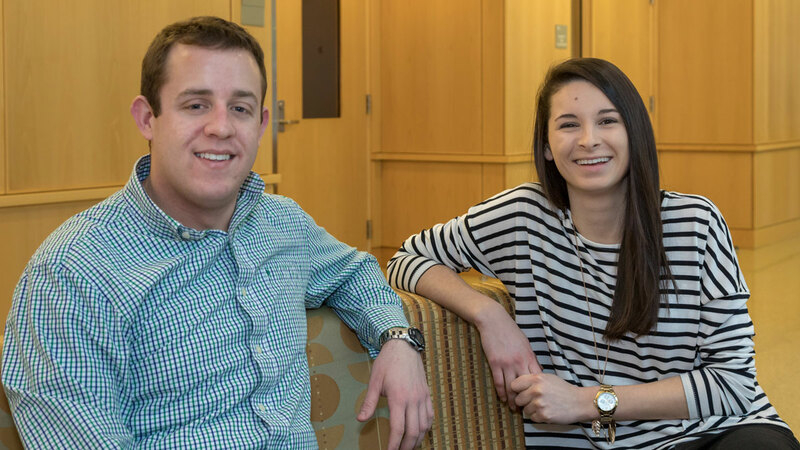 The Geisel School of Medicine Pano Rodis Fellowship in Compassion-Centered Medical Care encourages medical students to design and implement an independent project that addresses compassion-centered care. Community paramedicine is a new and emerging field that allows EMS staff to provide routine primary care to underserved rural populations. Some rural patients who lack easy access to primary care use 911 services for non-urgent healthcare, which can burden EMS services. Community paramedicine eases this burden by proactively meeting the needs of these rural residents. Maine, an early adopter of this concept, has established several licensed programs in the past few years. The first licensed paramedicine program in New Hampshire is in southeastern Strafford County—a hospital-based EMS system where hospital paramedics work in tandem with the hospital’s primary care practice permits. After more than a year of planning, which included reaching out to communities in the Upper Valley, acquiring state licensing, recruiting medical directors for both emergency medicine and primary care, creating a partnership with Dartmouth-Hitchcock Medical Center’s (DHMC) Lyme Clinic, and establishing an elective course for Geisel students, the pilot Community Paramedicine program launched earlier this year in two communities—Piermont and Orford. A winter term curricular elective allows medical students to accompany paramedics on house calls. Tom Trimarco, MD, who is the EMS medical director for DHMC and an assistant professor of medicine at Geisel, oversees the 27 agencies affiliated with the hospital, including Upper Valley Ambulance. “One of the great things about working with paramedics is their scope of practice can be augmented and advanced to practice outside or above their traditional scope,” Trimarco says. “We have the flexibility to take our highly educated providers, who are very good at what they do, and train them in nontraditional areas to meet the needs of patients. Upper Valley Ambulance paramedics and medical students serve as the eyes and ears of a primary care physician when they visit patients in their homes to do a physical assessment—taking vital signs, reviewing medications (including over-the-counter drugs and herbal remedies), and listening to the needs of the patient to gain a better picture of their overall situation. Often, patients who are isolated just need someone to talk to. This early intervention helps reduce the cost of healthcare for patients with manageable chronic conditions by avoiding hospitalization, re-hospitalization or both, Odell notes. Otherwise, a patient in this situation may wait until they are unable to breathe before calling 911 to be transported to hospital emergency care. Odell sees the program as a model for the future, particularly for the Upper Valley. With a territory encompassing nine rural communities spread over 340 square miles, there are many who could benefit from this service. 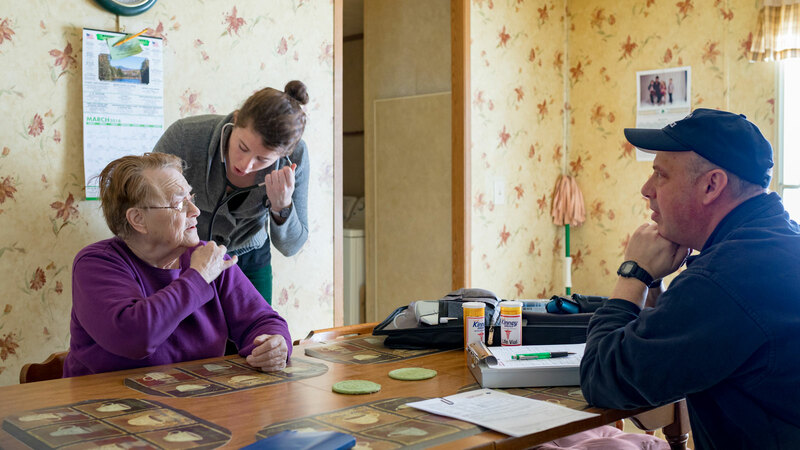 Careful to not compete with other home-based care agencies in the region, Valentini and LeClair reached out to make sure everyone was working in a collaborative rather than competitive manner. “Right now, we are trying to figure out and better understand the needs of our patients, their communities, and the DHMC patient base to see how we can grow the program and offer these services to more patients and communities and to make sure we are building the system to meet the common problems we are encountering,” Trimarco says. “Nick and Karissa deserve a lot of credit for their persistence in making this happen,” Odell says. And Trimarco agrees. “It has been a real pleasure working with Nick and Karissa,” he says. “I am constantly impressed with the quality and level of their work—they are the driving force behind this and I would certainly not have been able to move this forward on my own. They are tremendous students—smart, energetic, and personable.